Engaging students in learning statistics using The Islands. This framework helps teachers and students think about how to produce better statistical reports. I’ve been pondering what needs to happen for a student to be able to produce a good statistical report. This has been prompted by an informal survey I conducted among teachers of high school statistics in New Zealand. Because of the new curriculum and assessments, many maths teachers are feeling out of their depth, and wondering how to help their students. I asked teachers what they found most challenging in teaching statistics. By far the most common response was related to literacy or report-writing. Teaching students how to write. Helping students present their thoughts and ideas in a written report. Writing the reports for assessment- making this interesting. Helping students use the statistical language required in assessments. Getting students to adequately analyse and write up a report. These comments tend to focus on the written aspect of the report, but I do wonder if the inability to write a coherent report is also an indicator of some other limitations. 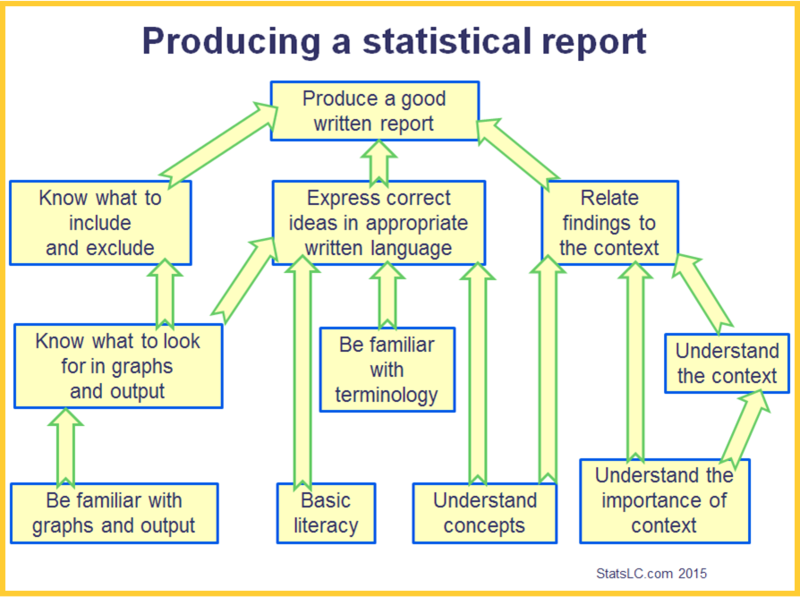 The following diagram outlines the necessary skills and knowledge to complete a good statistical report. In addition the student needs the character traits of critical thinking, courage and persistence in order to take the report through to completion. A framework for analysing what needs to happen in the production of a good statistical report. Though not sufficient on their own, literacy skills are certainly necessary. It is rather obvious that being able to write is a prerequisite to writing a report. In particular we need to be able to write in formal language. One common problem is the tendency to omit verbs, thus leaving sentences incomplete. Students must understand correctly the statistical concepts underlying the report. For example, if they are not clear what the median, mean and quartiles express, it is difficult to write convincingly about them, or indeed to report them using correct language. When students are unable to write about a concept, it may indicate that their understanding is weak. These days students do not need to draw their own graphs or calculate statistics by hand, but do need to know what graphs and analysis are appropriate for their particular data and research question. And they need to know how to read and interpret the graphs. This differs from the previous aspect in that it is a higher level of acquaintanceship with the medium. For example in a regression, students need to know to look for heteroscedasticity, or outliers with undue influence. In time series students know to look for unusual spikes that occur outside the regular pattern. In comparing boxplots students look at overlap. This familiarity can only come through practice. What is an important feature in one context, may not be so in a different context. This can be difficult for students and instructors who are at home with the purity of mathematics, in which the context can often be ignored or assumed away. Unless students understand the importance of context, often contained within the statistical enquiry process, they are unlikely to invest time in understanding the context and looking at the relationship between the model and the real world problem. Sometimes the context is easily understood by students, related to their daily life or interests such as sport, music or movies. However there are times when students need to become more conversant with an unfamiliar context. This is entirely authentic to the life of a statistician, particularly a consulting statistician. We are often faced with unfamiliar contexts. Over the years I have become more knowledgeable about areas as diverse as hand injuries, scientific expeditions to Antarctica, bank branch performance, prostate cancer screening and chicken slaughtering methods. Even though we may work with an expert in the field of the investigation, we must develop a working knowledge of the field and the terminology ourselves. This is where checklists can come in handy for students to make sure they have all the relevant details, and that they do not include unnecessary details. My experience is that there is a tendency for students to write a narrative of how they analysed the data, step by painful step. (I call it “what I did in the holidays.”) Students can also gain from seeing good exemplars that provide the results, without unnecessary detail about the process. This is probably the most obvious requirement for a good report. This comes from basic literacy, knowing what to look for, familiarity with the terminology and understanding of the concepts. Our report must answer the investigative question or research questions. Each of the statistical findings must be related to the context from with the data has been taken. This must be done with the right amount of caution, not with bold assertions about results that the data only hints at. If these three are happening well, then a good written report is on its way! So how do we make sure students have all the requisite skills and knowledge to create a good statistical report? To start with we can use the frame work provided here to diagnose where there may be gaps in the students’ knowledge or skills. Students themselves can use this as a way to find out where their weaknesses may be. Then students must read, talk and write, over and over. Read exemplars, talk about graphs and output and write complete sentences in the classroom. All data must be real, so that students get practice at drawing conclusions about real people and things. This framework is a work in progress and I would be pleased to have suggestions for improvement.